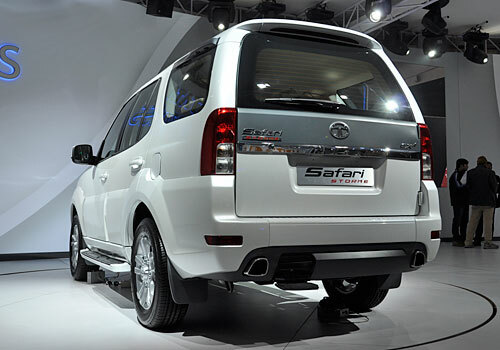 One of the most popular and home grown SUV prevalent in the Indian market is Tata Safari. This vehicle has the distinction of being one of the top selling SUVs from the formidable stables of Tata Motor group. It can be considered as one of the most economical SUVs owing to its reasonable Price and decent fuel efficiency. 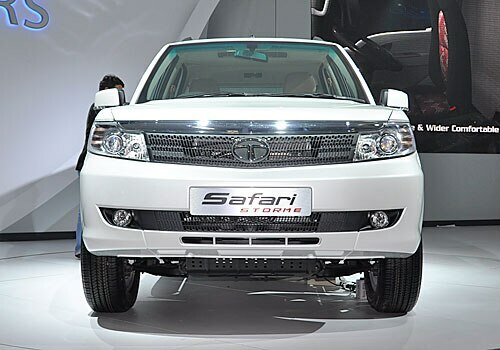 The company now is gearing up to introduce a face lifted and superior version of their older stalwart, which will now be christened as Tata Safari Storme. Quite a few Tata Safari Reviews state that this older version, which was launched around 14 years back still have a lot of rock solid fan base and numerous buyers in the market. But, with this new Tata Safari Storme coming in, the company is expecting to propel their sales and market share to a different level altogether. That was what the company is expecting and a few details about the older version. What we can expect from this new Tata Safari Storme is an aristocratic and sturdy exterior, which has undergone quite a few changes. The front façade is now looking bolder with an aggressive radiator grille, which also houses the company’s insignia. The Xenon powered projector lamps are fitted in the headlight cluster with bright fog lamps integrated in the newly designed front bumper. The rear has a major change with the spare wheel going under the chassis, which is making this SUV look smarter and complete. The interiors, however, are really done up really well, starting from the plush leather seats, which are exceedingly comfortable and the internal plastics and components are better than the older version. A new advance stereo system has been incorporated and the instrument cluster is very bright and attractive. The drive is amazingly smooth and with its perched up seat, you can view other smaller cars from a different view on the whole, which makes u feel like an aristocrat. All this comes at a good price, but this new Tata Safari Storme is expected to be priced in the range of Rs. 10 lakh. The heart of this new Tata Safari Storme is a commanding 2.2 litre DICOR diesel mill with 140 Bhp of power output along with a torque of 320 Nm. The pickup is excellent and the gear shifts are smoother than before thanks to the G76 MKII 5-Speed manual transmission gear box as stated in a couple of Tata Safari Storme Reviews. This new SUV is said to be fitted with several good quality safety features such as six airbags, traction control, ABS with EBD, electronic stability program with brake assist and many more protective features for the occupants. In conclusion, this new SUV will definitely generate a very good response for the company and might become the leader in its segment very soon after its launch. Apart from this, a few other SUVs such as New Chevrolet Captiva, Renault Duster, Audi Q3 and Premier Rio Diesel are also going to be launched in the coming months and there will surely be chaos in the SUV segment. I shared that 2012 Mercedes Benz M Class Anticipated to Launch on 15th May and Nissan Sales Move up.